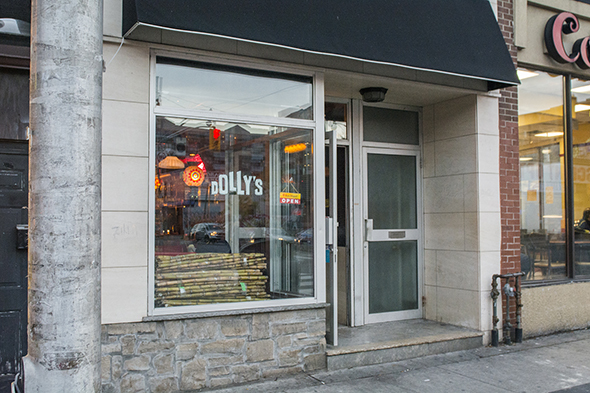 Dolly's is a Filipino mojito bar and panciteria, and can be found in Bloordale in the space that was previously the Whippoorwill . Dave Sidhu, the man behind the Playa Cabana empire, named this place after his Pinay/Filipina mother, as a tribute to the dishes she made while he was growing up. Filipino food is in, and Sidhu wants to feature the cuisine he grew up eating (but tweaked a tad to suit his restaurant). He offers up a menu of Pinoy faves along with mojitos in this 47-seat space, which seems to have inherited the red booth seating from its predecessor. 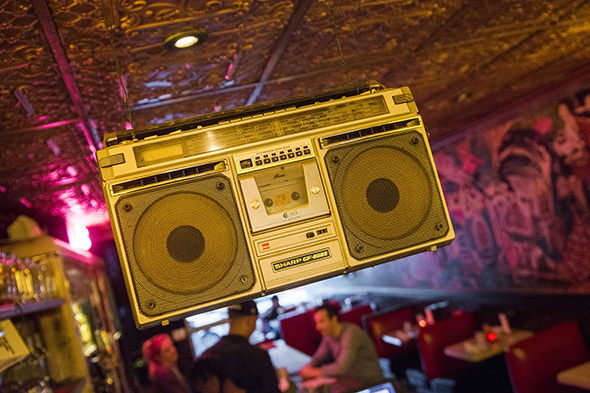 Outfitted with funky decor like a mural by artist Bryan Espiritu who owns The Legends League , a boombox hanging from the tin-tile ceiling and mirrored tiles on the walls, this is a rad spot that pumps out a hype soundtrack of '90s and early '00s R&B/hip-hop jams (think Salt-N-Pepa, TLC, Destiny's Child, J. Lo, Jay Z, Ja Rule, etc.) during our visit. It will make you want to get down. 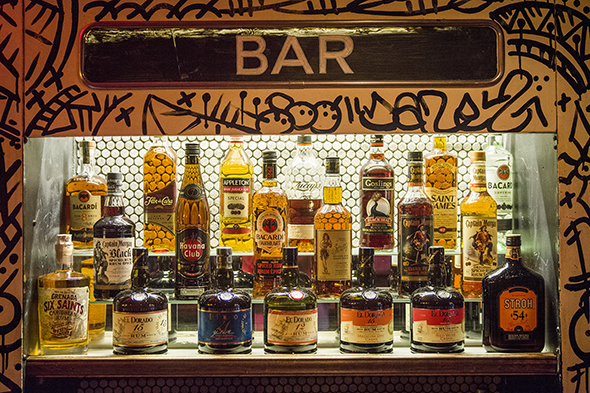 Some may be surprised to hear about Filipino mojitos, but the Philippines is actually a big producer/exporter of rum. 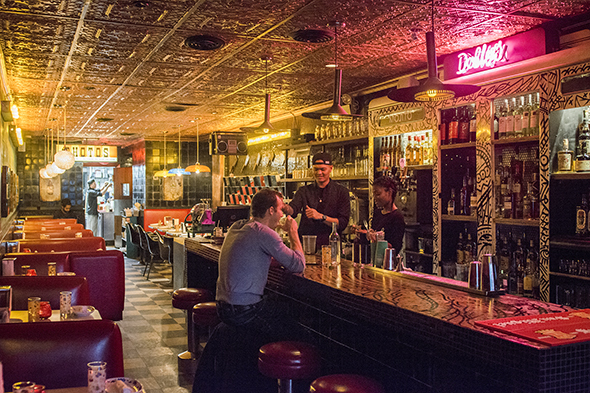 Here, the cocktails are naturally sweetened with fresh-pressed cane juice (you can see sugar cane piled up in the front window); Dolly's has its own press. 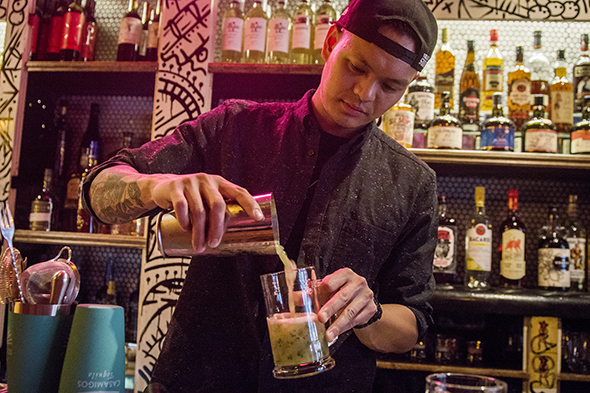 To keep things tropically authentic, fresh coconut and pineapple are also used for drinks. There are four house mojitos to choose from, and they come in three sizes: small ($6-8), large ($10-$14) and pitcher ($30-$40). 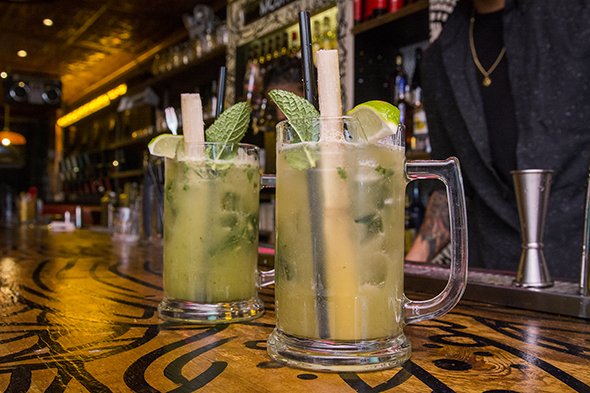 We get large Cubano mojitos ($10 each) with 2.5oz of Bacardi Maestro white oak rum, fresh-pressed cane juice, muddled mint and fresh-squeezed lime juice. They come with a stalk of sugar cane as garnish and pack a boozy punch. Local craft beers ($7-8) are offered on rotating taps, and of course, bottles of San Miguel ($7), a Filipino pale lager, are available. The food menu is split into pulutan (snacks), ulam (rice) and pancit (noodles), with all the Filipino faves covered: lumpia (spring rolls - Sidhu's aunt makes them), lechon kawali (crispy pork belly), adobo (marinated chicken or pork), kare kare (a traditional stew) and pancit bihon (stir-fried rice noodles). 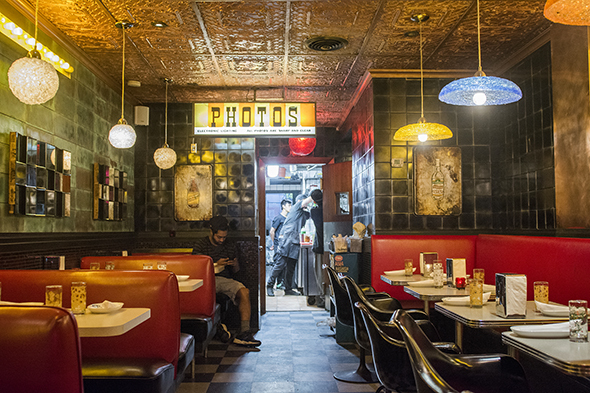 A late-night menu is also offered on weekends from 11 p.m. to close that features different siopao (steamed buns) served with banana ketchup. 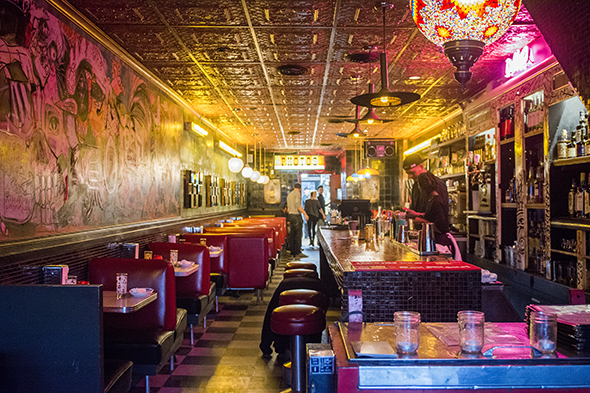 In addition to calling itself a mojito bar, Dolly's also makes most of its noodles in house, hence the panciteria title. Alas, we end up trying a dish that doesn't use house-made noodles, as thin vermicelli-like rice noodles might prove difficult to produce in the kitchen. 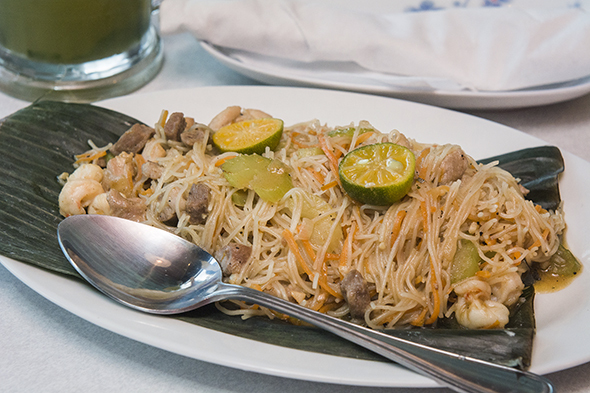 Dolly's pancit bihon ($17) combines thin rice noodles (good for the gluten-free inclined) with pork, chicken, shrimp, celery and shredded carrot, plus some calamansi to squeeze over like lime. Its flavours are comforting (if a slight bit too salty) and hit the spot, but the price for this is a little too steep. You can get this for much cheaper at Bathurst and Wilson (although to be fair, I guess the rent is a lot less over there, too). 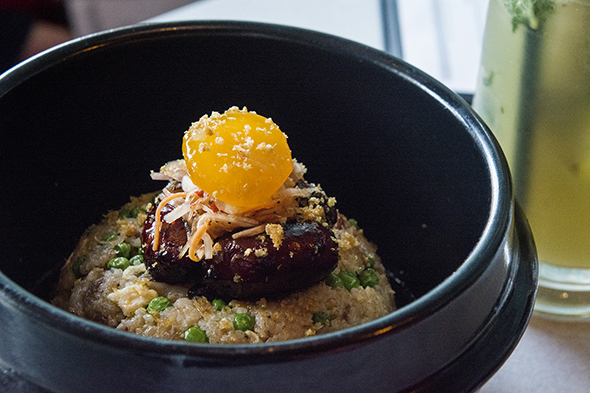 Filipino fried rice with longanisa ($16), served in a deep, dark bowl, is the highlight for me. Topped with tart and gingery pickled veg, deliciously sweet and savoury pork longanisa links and an egg yolk cured in salt and sugar, this is a delight to eat. The yolk is like sticky, chewy candy, and the links are crazy-addictive. The moist fried rice contains chicken, shrimp, pork, egg and peas, and comes surrounded in a tasty pool of sauce that's a combo of soy, cane vinegar, kaffir lime and bird's eye chili. It's a nice confluence of flavours. 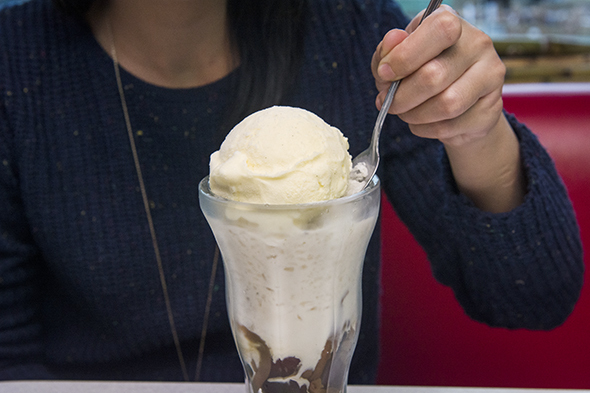 For dessert, there's the classic halo halo ($9), a kitchen sink of sweet stuff in a glass: shaved ice, vanilla ice cream, condensed milk, corn, red bean paste, tapioca, preserved fruit, grass jelly, coconut meat...all of the things. I'd be interested in returning to try some of the house-made pancit and the super purple ube macapuno (purple yam and coconut) cake, but mostly, I love the atmosphere here - and the tunes.